« Top 10 of 2018! 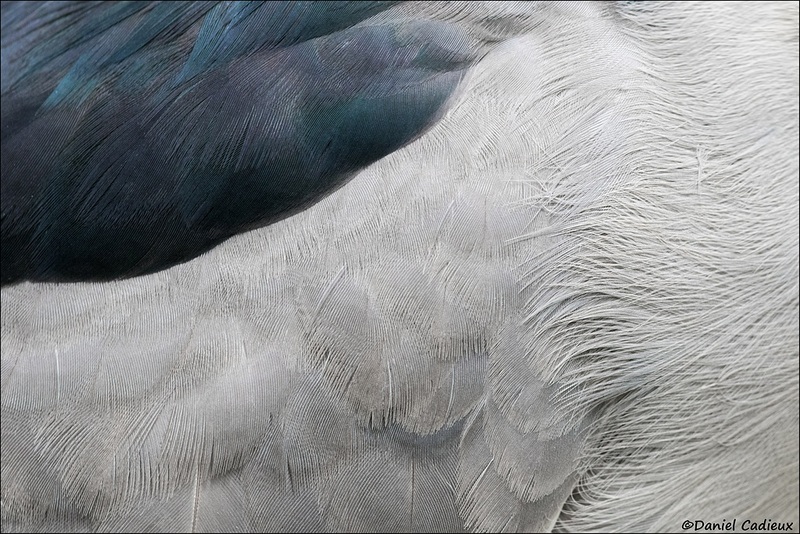 One thing I love to do when encountering larger tame birds is to photograph “abstract” close up details of the feathers. 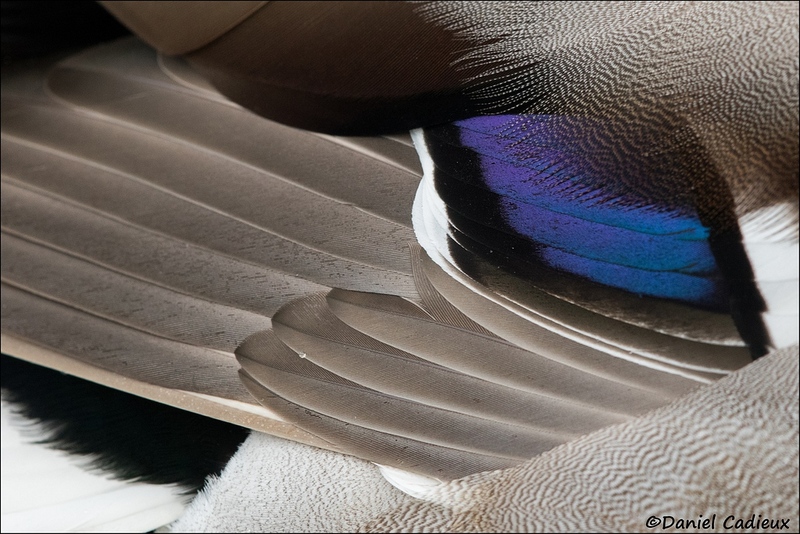 Waterfowl, especially ducks, are excellent subjects to experiment this with as their wings and flanks are often adorned with spectacular patterns and colours. Gadwall, Canon 7DII + 500mm f/4 II, manual exposure, evaluative metering, 1/1000s., f/11, ISO 800. The majority of the time, their best wing colours are actually hidden gems, most often only visible in flight, or during a wing stretch. At times you can see hints of those when they are at rest, usually when sleeping and in full relaxation mode. This is great for a couple of reasons. The first, obviously, is that you want those colours and patterns showing to add even more interest to the close ups. The second, is that photographing subjects from such a close distance is very difficult on a moving bird. Composing can be a real challenge, and getting a tack-sharp file, especially with slower shutter speeds, rather disadvantageous. Concentrating on a resting individual gives you all the freedom and time to properly compose and adjust settings on the spot, plus achieving desired sharpness a much easier proposition. Wood Duck, Canon 7DII + 500mm f/4 II + 1.4TC III, manual exposure, evalautive metering, 1/200s., f/10, ISO 1600. Photographing these subjects from so close requires stopping down the aperture, often quite a bit, to get the details rendered sharp on most (or all) of the “canvas”. Birds are not flat, and details at the edges or corners will fall off of depth-of-field (dof) range. Photographing wide open will almost always result in unpleasing large out-of-focus (oof) areas. Even stopping down will often result in slightly oof details at the edges, but in a much less obtrusive manner. 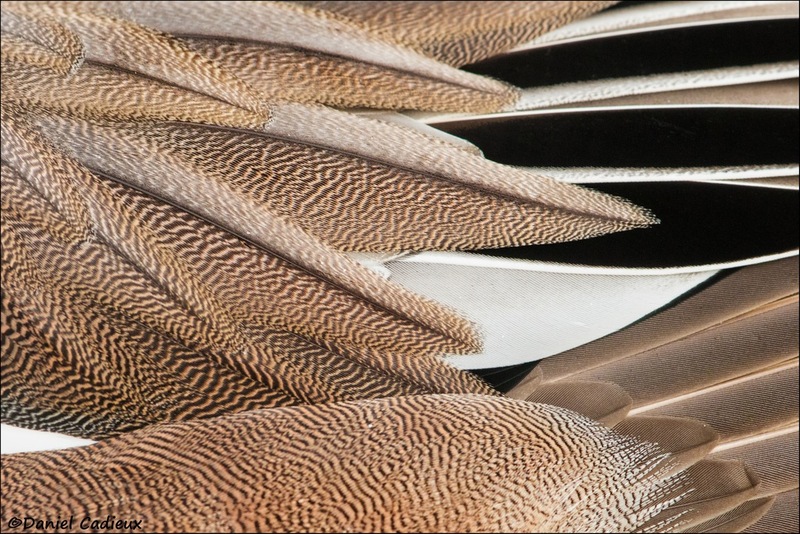 If you cannot get the whole image within dof range, you will absolutely want to have the most visually engaging area of the plumage in sharp focus. That may be a bolder pattern, or brighter patch of colour. What ever part is most likely to have your eyes go to first must be sharp for this type of image to be successful. American Wigeon, Canon 7DII + 500mm f/4 II + 1.4TC III, manual exposure, evaluative metering, 1/400s., f/9, ISO 1600. Another thing to be careful with is composition, especially the way larger feathers, patterns, or colour patches are included within the frame. None of those should be slightly clipped at their points at the edges of the frame, and ideally with some space between the tip and the edge of the frame. If their is no way to fully include them, then a solid “cut” should be used. No two birds will present the same compositional challenges, with every image needing its own carefully composed visual elements planned and executed. I’ll often “fine-tune” a composition during post-processing via a small crop to help. Mallard, Canon 7DII + 500mm f/4 II + 1.4TC III, manual exposure, evaluative metering, 1/400s., f/9, ISO 1600. Although ducks are the main, and easiest, subjects mentioned here, there are many other possibilities with other species to this with. Anytime a bird allows close enough approach to be able to include a feather abstract, take a moment to evaluate the options, and go for it…it is fun and gets the creative juices flowing. Even if none of the frames turn out as anticipated, the educational value of experimenting like this is the best way to learn! Great Blue Heron, Canon 7D + 500mm f/4 II + 1.4TC III, manual exposure, evaluative metering, 1/160s., f/11, ISO 800. Black-crowned Hight-Heron, Canon 7DII + 500mm f/4 II + 1.4TC III, manual exposure, evaluative metering, 1/250s., f/8, ISO 1600. Wild Turkey, Canon 7DII + 500mm f/4 II + 1.4TC III, manual exposure, evaluative metering, 1/250s., f/11, ISO 1600. Bohemian Waxwing, Canon 7DII + 100mm f/2.8 macro lens, manual exposure, evaluative metering, 1/2s. (self timer), f/13, ISO 1600. For those wondering how I got so close, the Bohemian Waxwing image above is from a window-strike victim. The bird was brought indoors and photographed as you see here. It was then returned to nature to “give back” to the cycle of life. Even in death it left a wonderful visual legacy to admire. I hope these images gave you food for thought in what you can go for with large and tame birds. 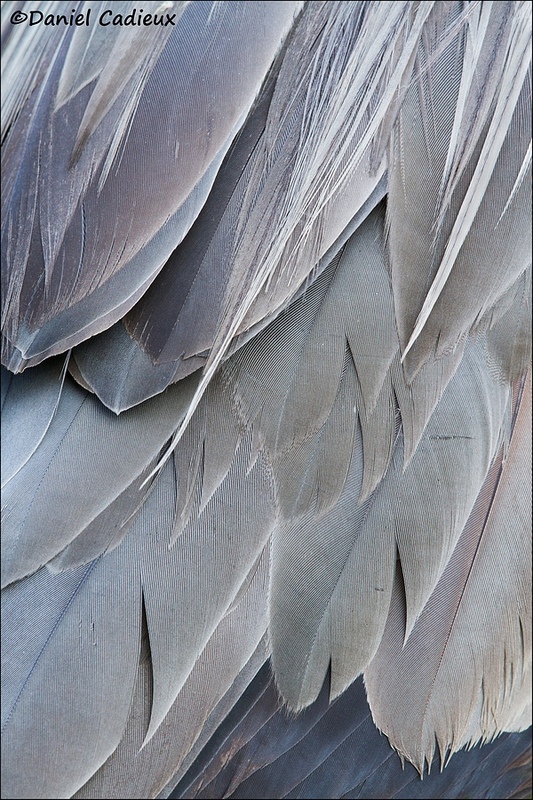 You can be sure that I will expand on my “abstract feather” portfolio with other potential subjkects such as geese, gulls, game birds, perhaps shorebirds, and/or other subjects…the sky’s the limit! In finishing, which image in this blog post is your favorite (and why), leave a comment below to let me know! 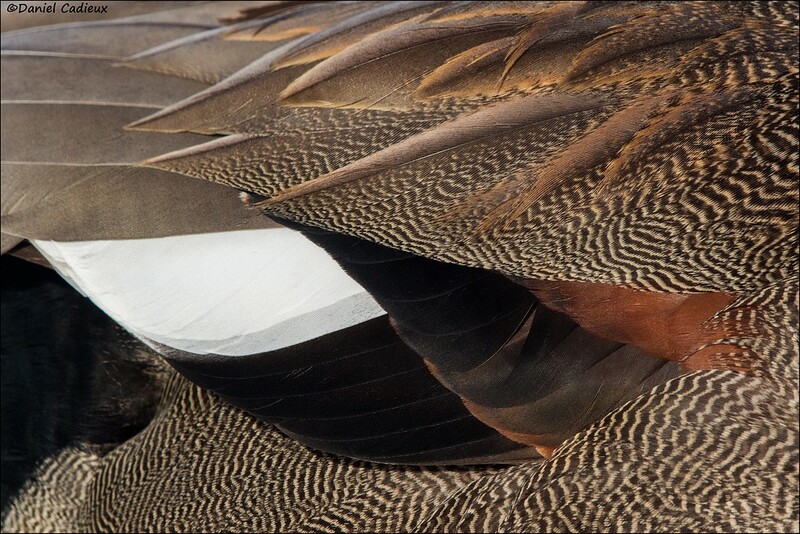 Although all your images are a treat for the eye, the wild turkey macro is my favorite. If I didn’t see the title I would have thought this was a pinecone. I hope to try out this technique in the Spring with my sister’s flock of chickens. Thanks for sharing! Thanks Arlene! 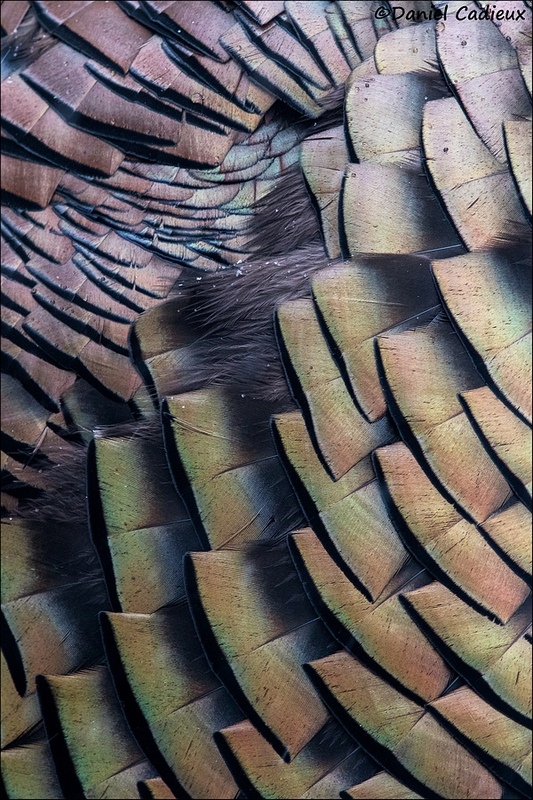 Turkeys have a surprising array of colours when seen from up close – glad you like it! Beautiful images! I kept going back and fourth and they are all unique individually and I love them all. Close ups are a lot of fun. 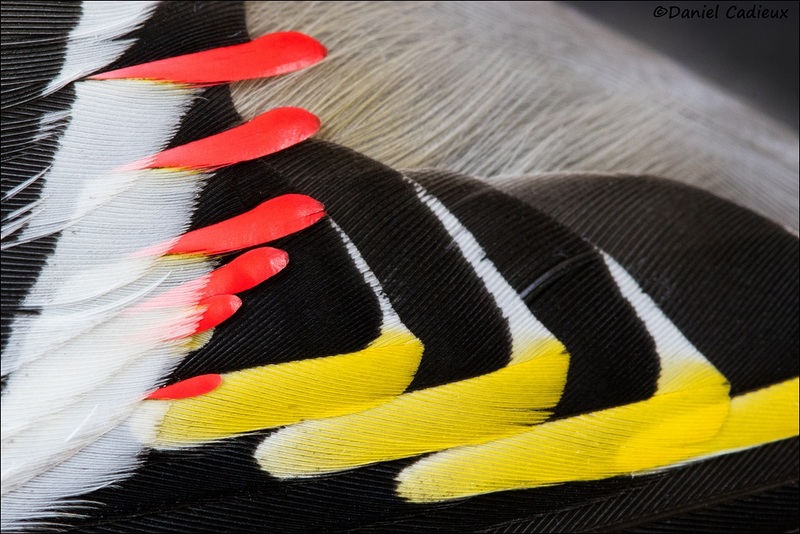 Bird’s feather have dedicate patterns, repeated lines and curves, and brilliant colors. As you mentioned, getting edge-to-edge sharpness is no small task when depth of field and slower shutter speeds are required, especially with active subjects such as birds. It is equally as important to understand the bird’s behaviors in order to photograph them while they are resting or sleeping. Few times I was fortunate enough to photograph the Lesser Flammagos sleeping at the zoo, and thus appreciate these beautiful images you share with us. I rely on my tripod in order to slow the shutter speed to 1/30 sec on a 400 mm lens. Are you hand holding yours ? If so, I am very impress. 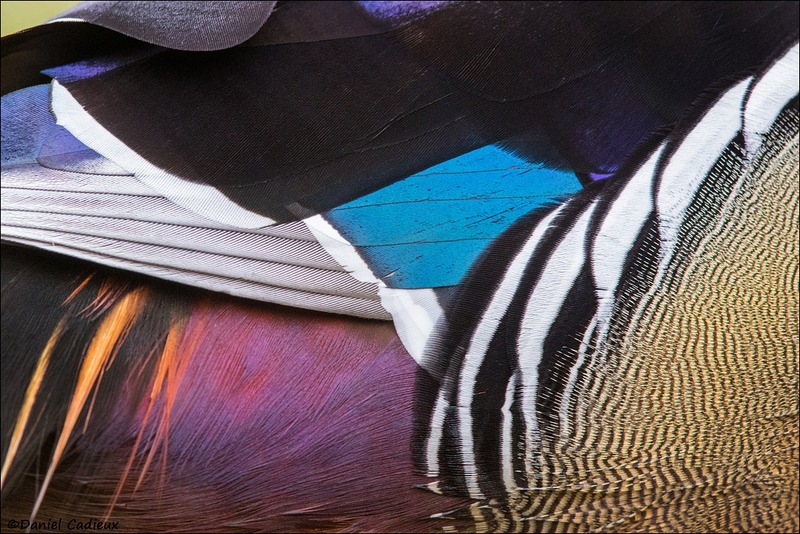 I think the Wood Duck and the Waxwing tie for me… Both are truly incredible colors and designs. Thanks Austin! Birds really come in great colours don’t they!